The BISSELL Lift-Off Floors & More Pet is a great choice for anyone who wants a cordless model capable of cleaning any type of surface. 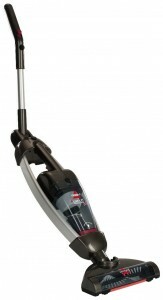 The brush-roll can be switched so that the sweeper can work on both hard floors and carpeted areas. The fact that this model is designed for gathering pet hair and dander with ease makes it the ideal option for people with pets. The handle can be folded so you can reach under furniture and collect all the hair balls and dust bunnies hiding there. Since pets love exploring every corner of the house, including hard to reach areas, signs of their passing are usually hair and other remains that you will have to clean afterwards. The BISSELL Lift-Off Floors & More Pet is considered by many a great tool and one of the best electric brooms for tile floors, but it is not ideal if you are planning to clean the entire house and especially large areas covered with rugs and carpets. The battery must be recharged for 16 hours in order to use it again, so you should plan ahead what needs to be cleaned as you will not have a lot of time at your disposal to do everything you have in mind. This is a 2 in 1 tool that will offer you the most important advantages of both a stick vacuum cleaner and a handheld model. Basically, you can use the BISSELL Lift-Off Floors & More Pet on any kind of surface you want, be it hard floors or carpets. Equipped with a powerful brush roll, this sweeper will do a great job, no matter what surface you want cleaned. Capable of picking debris and dust from virtually everywhere, this is the type of cleaner you can count on. When you need to clean more delicate areas, such as laminate surfaces, you must only switch the brush off and you will manage to get everything pristine clean without any effort. In its handheld version, the tool will help you clean upholstery, and other difficult to clean areas. A stick vacuum cleaner that can be transformed into a handheld model is convenient enough, but this model comes with something extra: great maneuverability. The sweeper has a swivel head that is easy to maneuver around, so you can reach all kinds of areas that are not easy to clean. The 2 way folding handle allows you to reach under furniture and any corners and edges that can be a problem when you are not using the right tool. What makes this model really stand out is its ability to clean after the mess pets make in any household, no matter how much they are cared for. The rubberized nozzle attached to the removable hand vacuum does a great job at pulling out pet hair from furniture, chairs and so on. The lint strip is designed to remove pet dander and hair from hard floors, for maximum results.